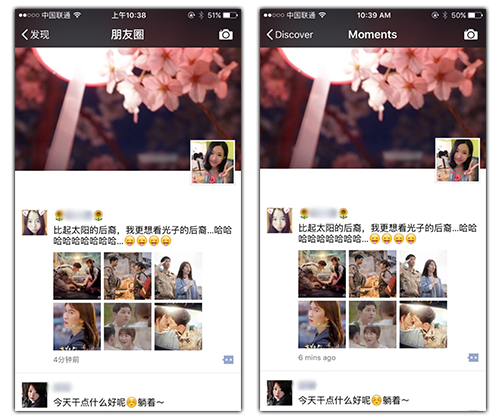 Are you familiar with WeChat? 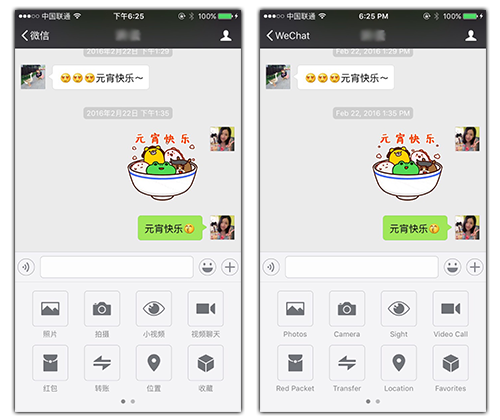 WeChat is one of the biggest chat apps in China, currently boasting over 9 billion users. It is used similar to how WhatsApp, Viber, LINE, etc. are used in other countries but with mainly Chinese users, so you can make a lot of Chinese friends if you have WeChat. 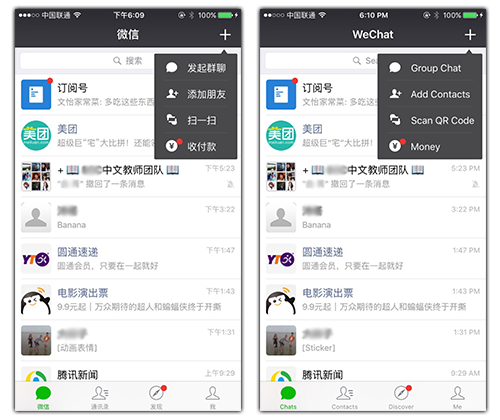 With WeChat, not only can you send messages to friends, but you can also do other things like buying train tickets, movie tickets and transferring money to friends. 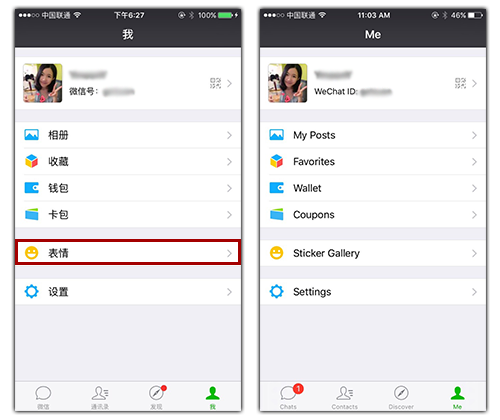 You can learn more about WeChat on Wikipedia, and learn how to register on WikiHow. Could I add you on WeChat? Instead of typing in a username or number, user information is often exchanged by scanning the other person's QR code. 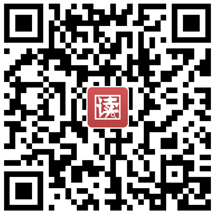 Now, how do you say “scan QR code” in Chinese? 1. Will you scan me, or should I scan you? 2. I'll scan you (your QR-code). 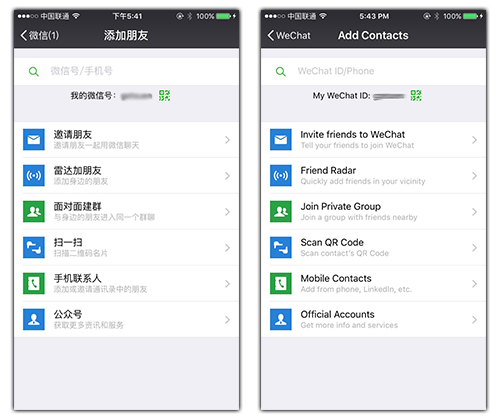 Below is the ”Add Contacts” page of WeChat. Now that you've added your friends, you can start chatting! You can send messages or voice message to your friends. Many Chinese prefer to send voice messages instead of text messages, as it saves you from having to type anything. How do you say voice message in Chinese? You also can send 表情 [biǎo qíng]（emoticons/stickers） to your friends. There are a lot of fun stickers available to download for free. You can press 下载 [xià zài]（download）to get the stickers. It is also common to create chat groups for people with same hobby etc. You can try to start a group yourself. You can create a group from here. You also can post something on your 朋友圈 [péng you quān]（Moment）, to let your friends know what you're up to lately. It is used in the same way as the timeline on Facebook. 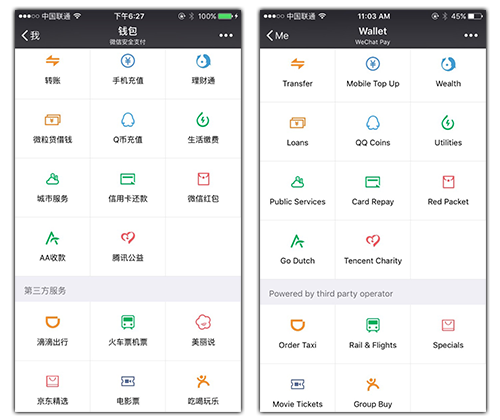 And you can buy movie tickets and other things using “钱包 [qián bāo]（Wallet）”. Now that we've learned so many WeChat related terms, I’m sure you'll be able to use the Chinese version of WeChat, so that you can practice your Chinese while you chat with friends. So what are you waiting for? Let’s download WeChat, make more Chinese friends and have fun!